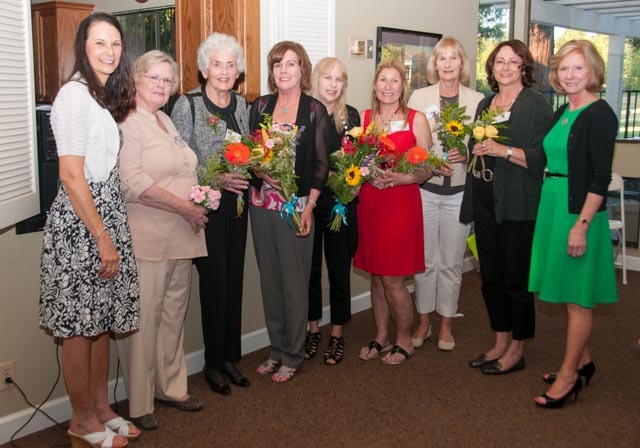 Danville-Alamo-Walnut Creek 2013-2014 Executive Board Members, Installation May 30, 2013. Left to right, Installing officer Mary Mix, President-elect Mary Ellen Blake, Co vice president programs Mimi Knox, Co President Karen Large, Co President Loretta Alsthuler, Co vice president programs Jo-Anne Lyons, Co vice president membership Susan Terzuolli, Co Secretary Olga Erbe, Installing Officer Marcia Steinhardt. Absent: Co membership vice president Elizabeth Williams, AAUW Funds vice president Carol Kennedy,Co Secretary Nell Fraser, Treasurer Joyce Tenney.